Service, if ever needed, will be provided locally. No dialing 1-800 phone numbers, no long distance factory service depot, no having to wait all day for the repair man to show up, and no waiting for up to two weeks for the scheduled appointment to occur. Does this sound familiar? In today’s world of “big box stores”, isn’t it comforting to know that you can still find good old fashioned service without all the hassles. Appliances sold by S&D are functionally guaranteed for 1 year in Waterloo region. When you visit or call our store, you receive a wealth of experience and product knowledge. For instance, some of our factory trained service personnel have been in the appliance business for over 25 years. Well that’s impressive! So .. whether it’s our expert advice, or the Factory Direct parts supply we offer, the Appliance Scratch and Dent outlet remains — one of this regions most trusted sources. 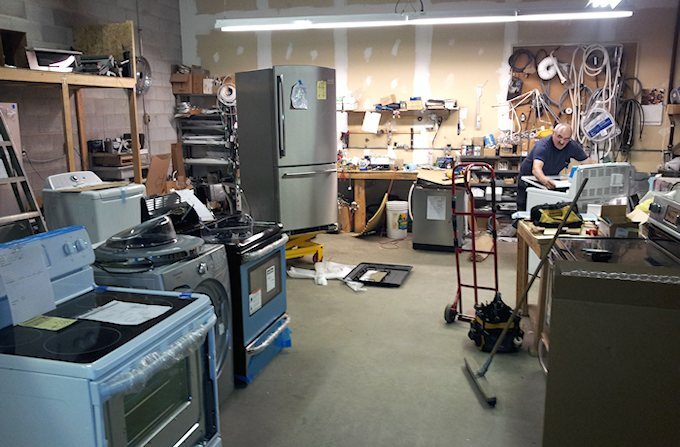 Customers who purchase appliances from us receive in-house Factory Authorized Service. That’s the best!